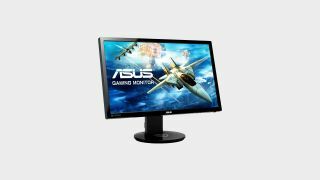 Some of our preferred gaming monitors, across the price scale, are on offer right now at Amazon UK. Monitors just feel like a great purchase: likely to outlast other components or hardware items by years, they'll present you with incredibly detailed pictures and help you gain an edge in the twitchiest of online games. It's great news, then, that some of our favourites are on offer right now over at Amazon UK. Our best budget option, the ASUS VG248QE—that has an excellent 24-inch Full HD LED display, sporting a 1ms response time and 144Hs refresh rate—is the pick of the bunch dipping below £200 and making it a very impulse-purchase worthy potential. The ASUS VG248QE offers great value, but there's others going offering enormous bang for your buck if you've got a larger budget at your disposal: our top two are on offer aswell. The ASUS ROG Swift PG279Q, our favourite gaming monitor currently, has a healthy 50-odd quid off, and the 4K HDR behemoth from Acer, the Predator X27 which is just one of the best monitors for anything available now, is at its lowest every price in the UK with an enormous 500 pounds off. These are all excellent deals and will bag you some of the best monitors in the business and should last you a long time. To further your research, see more information on each, and others, in our best gaming monitor list here.